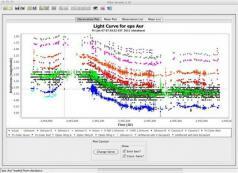 VStar is a Java-based piece of software that allows users to view, analyze, edit and export variable star observation plots. You do not need to install the application in order to use it, but it does require Java installed on your computer in order to work properly. You can open a new star from a file stored on your hard drive, which can be a CSV, TXT, TSV or DAT document, although you can also load it from the AAVSO database. It is possible to select a different start, the minimum and maximum JD, the star and its group. Then, VStar lets you analyze the plot, edit chart properties, and zoom in/out. Furthermore, you can export the plot as a PNG image or just copy it to the clipboard and paste it in a supporting app. The application also offers the possibility to view and analyze observation regarding numerous types of star-related data, perform pattern search operations, review means, manage plugins and load scripts among others.